Many column inches have been expended in pursuit of ‘nasty nats’—those Scots impatient to live in a normal, independent Scotland but whose impatience provokes them into rash statements and personal attacks on those who stand in their way. I have found few of the nasty kind. Most are quiet, dedicated and, if passionate or articulate, neither hostile in expression nor personal in attack. Most of us are also on record as fans of the English, admirers of their culture and champions of what our two countries achieved together. But, sometimes, a blithe England-as-centre-of-the-universe insouciance exasperates even its fans to the point of anger. This happened again just this morning when I sprayed coffee all across an article in SoS that a statue of the Duke of Cumberland was again to be placed on the empty plinth in Cavendish Square in London. Westminster Council (second only to the CofE as “The Tory Party at Prayer”) has commissioned Korean artist Meekyoung Shin to sculpt another life-size likeness of William, the Marquess of Berkhamstead in the County of Hertford, Earl of Kennington in the County of Surrey, Viscount of Trematon in the County of Cornwall, and Baron of the Isle of Alderney—better known as the Duke of Cumberland, second surviving son of George II—to replace one removed in 1868 in deference to Scottish sensibilities. Replacing it now may not be a unionist ploy to piss off the Scots—but it’s hard to imagine a more tasteless one that would tread on our sensibilities in any more clodhopping fashion. Displaying physical courage at an early age, William became his parents’ favourite and rose quickly in the Army to command the Foot Guards and then England’s eternal tussle with the French. He was victorious, if wounded, at Dettingen (1743) but fluffed his chance at Fontenoy (1745). By this time, Charlie’s wild Highlanders were on the march towards Derby and, in the ensuing panic, he was recalled from Flanders as a popular general who would deal with this worst of these recurring Jacobite rebellions. Credited with pulling together and training a badly rattled British army to face the apparently unstoppable energy of a Highlander charge, William chose his ground well at Culloden Moor. His men scythed down the clans where they stood with grapeshot from artillery, flanked them with musket fire as they charged in frustration and defended with a new, simple close quarter tactic—bayoneting the enemy to their right beneath his targe. Thus far, history shows him a capable, if unremarkable, general who got done the key job of clearing the threat of invasion from the rear. But, such was the fear the Highlanders had induced that he went much further, ordering his men to advance after the wild charge had been broken to bayonet enemy wounded found on the field. For his 52 casualties, he left 1,200 Jacobite dead on and beyond the moor, taking only 550 prisoners (mostly French, the only ones he recognised as legitimate combatants). With the tacit support of the King, government and much of Lowland Scotland (Glasgow even awarded him an honorary degree), he then set about systematically dismantling the gaelic-speaking Highlanders’ way of life. Although ‘government’ clans like the Campbells were spared, Jacobite clans (almost all Catholics) had suspected rebels murdered complicit settlements burned and rapacious soldiers billeted on them. But, most ruinous of all, the herds of cattle by which clans measured their wealth were driven off and auctioned to part-pay for the campaign (and end up in some officers’ purses). It was systematic destruction of a way of life, a genocide before that word had been coined. Quite apart from the hundreds killed or died of starvation, proud clan chiefs were ruined along with their clansmen. And many, defying Highland custom of holding land in trust for the whole clan, became English-style landlords, turning clan lands into businesses, replacing subsistence farming with sheep, thereby throwing thousands into homelessness and starting the Clearances. Though only there a year, Cumberland’s harsh influence still echoes through empty glens or lies mute under rickles of stones that were once homes. Ironically, to survive many clansmen joined the very army destroying their heritage. The famous Highland regiments were formed from them. Each earned praise from officers up to Wellington for resolute toughness, courage in adversity and a fearsome effect upon Britain’s enemies around the globe. It was only when the Clearances had long done their baneful work that the British Army found any regret—that it could no longer raise fierce Highland battalions for the Crimean War as it had done for the Napoleonic. Cumberland returned to Flanders where his undistinguished generalship lost the Battle of Lauffeld and ended the war for a while. The relieved British establishment had meanwhile lauded him as ‘Sweet William’ after the common ragwort dianthus barbatus. But his epithet among Scots is they call this plant ‘Stinking Billy’. As his post-Culloden predations became better known, his political ambitions were frustrated. Even a return to military action in the Seven Years War did him little good. While Britain was generally victorious, Cumberland lost Hanover to the French. On his return, George II’s dry comment was: “Here is my son who has ruined me and disgraced himself”. He failed even to secure the regency over his nephew, George III, when his elder brother died. Cumberland spent his last days advising his nephew. It is not known if he was complicit in forming George III’s intransigence that lost Britain its American colonies. 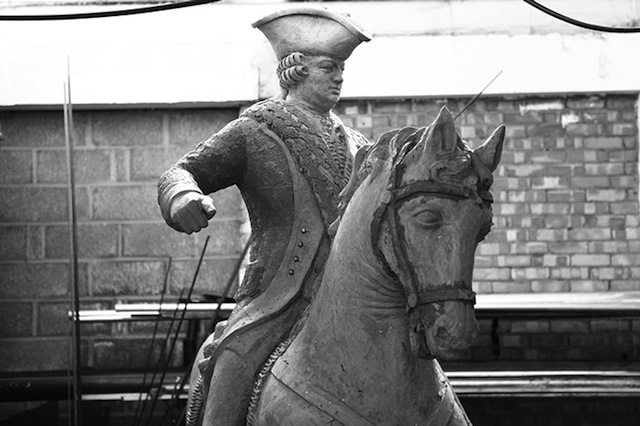 He died in 1765 and an equestrian statue in lead was cast in 1770 for a plinth, originally intended for a statue of Queen Anne. That it stayed almost 100 years before being removed speaks volumes for English chauvinism and insensitivity. That another is being erected does little to dispel the feeling that either has moderated in the meantime. The only good news is that it is being sculpted in aromatic soap so that Stinking Billy can slip away from us, albeit more slowly this second time. This entry was posted in Community and tagged Culloden; Cumberland; clearances. Bookmark the permalink.